The move comes alongside efforts to curb alcohol sales in the nearby border town of Whiteclay. 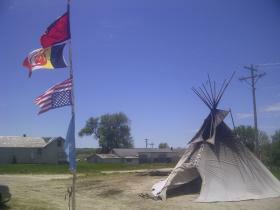 A protest camp against alcohol sales in the town of Whiteclay, Nebraska at the reservation border. Those like tribal council member Kevin Yellow Bird Steel say local law enforcement ties up much of its time picking up those who are drinking illegally. He says the federal budget sequester means even fewer law enforcement resources on Pine Ridge. Yellow Bird-Steel says he personally supports the idea of removing prohibition as a way to free up tribal police to go after more major crimes. “Why worry about the guy who’s walking down the street drinking who’s not doing nothing wrong. Because the minute they pick him up and take him to jail then the real crimes start happening,” says Yellow Bird-Steel. Officials say the issue of lifting tribal prohibition is not an easy one. Council Member James Cross says his constituents are split down the middle on the issue. But Cross says he personally cannot support legalizing alcohol—because it brings so many problems. “A lot of the domestic abuse the family disputes are alcohol related. The car crashes, so there is a long list of alcohol related issues that we face here on the reservation,” says Cross. If the council approves a tribal referendum the public vote on prohibition would not take place until 2014. Meanwhile, Oglala Sioux Tribal President Brian Brewer is challenging the tribal council to join him in a protest in the border town of Whiteclay. President Brewer invited council members to walk into Whiteclay on Monday morning to oppose the delivery of beer to the small town. Brewer says the liquor stores prey on the impoverished people of Pine Ridge – he is asking for sales to stop in Whiteclay. He says Nebraska officials have failed to listen to the requests by the Oglala Sioux Tribe to resend the liquor licenses in Whiteclay. “Next Monday morning the liquor trucks roll into Whiteclay. I’m going to walk in. And I’m going to ask the council if you are true leaders I want you to come with me. No one else, and I’m asking the council to come with me. No one else. And I’m asking the council to come with me. No one else, let’s make a statement to our people that we are really concerned about this,” says Brewer. Protesters are accused of stopping and vandalizing beer trucks as they enter Whiteclay. A liquor store owner is accused of arming local thugs with baseball bats to intimidate protesters camped nearby. Brewer is backing the protesters but asks them to remain peaceful. He is also asking them to stay back on Monday morning and let tribal government officials lead the protest. This entry was posted on Tuesday, June 11th, 2013 at 11:25 AM and is filed under News. You can follow any responses to this entry through the RSS 2.0 feed. Responses are currently closed, but you can trackback from your own site.